Is this built into your teaching? If so, how? How does it affect students’ understanding? If not, why not? Do you think building it in would be useful? Come up with 2-3 situations (other than the ones that Arons mentions) where analyzing beyond the “crossover condition” may be helpful for students’ understanding of the phenomenon in question. Think about how you might incorporate these into class this year. Find some dry bluntness, well-placed snark, or something clever that made you LOL. What did you find in this chapter that you think is pure gold (in terms of teaching strategy)? 5. Also, I could use some help with equations 4.10.1 and 4.12.1 on pages 126 and 129! This year our science department decided to invite our community members to the high school to learn about science. Not only was this a chance for us to bring the joys of science to the public, it was a chance for our students to share their knowledge outside of class. We decided to focus the event by choosing a theme that we thought would tie together all of our different scientific disciplines. 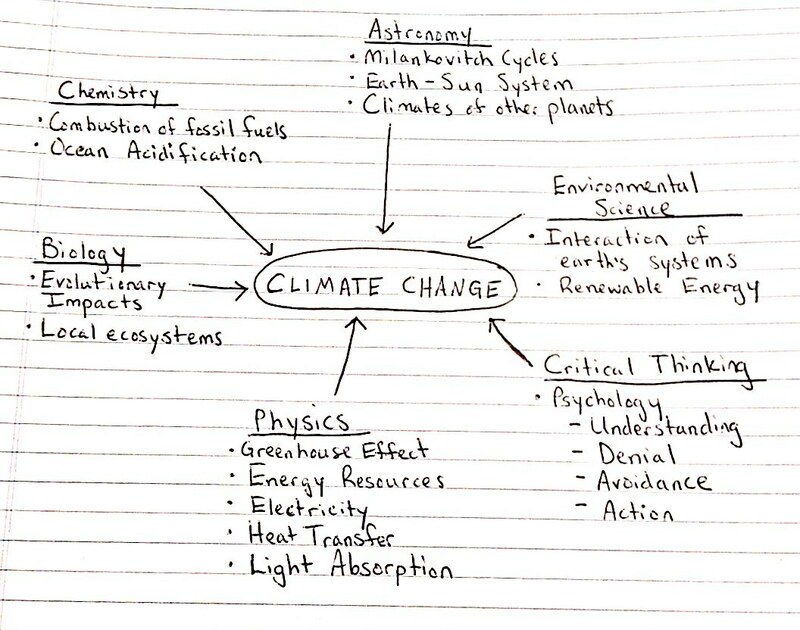 We decided on ‘climate change’ because we thought that climate science was fascinating and was also an important issue that all people should learn about. After proposing this idea to our students we took a day early in the year to bring all of the science students to our auditorium to hear a presentation on climate change. We then went back to our separate classrooms and had students study different aspects of climate change that related to our content areas. Physics students studied human energy use, chemistry students studied ocean acidification, biology students studied the evolutionary implications of climate change, etc. Students then put together projects on their research questions that they could present at Science Night. We invited guest speakers – a climate scientist and local meteorologist. We marketed the event around the school, in the local newspaper, and in the school newsletter. We also asked our students to invite as many people as they could. We hosted the event on a Friday evening in May. 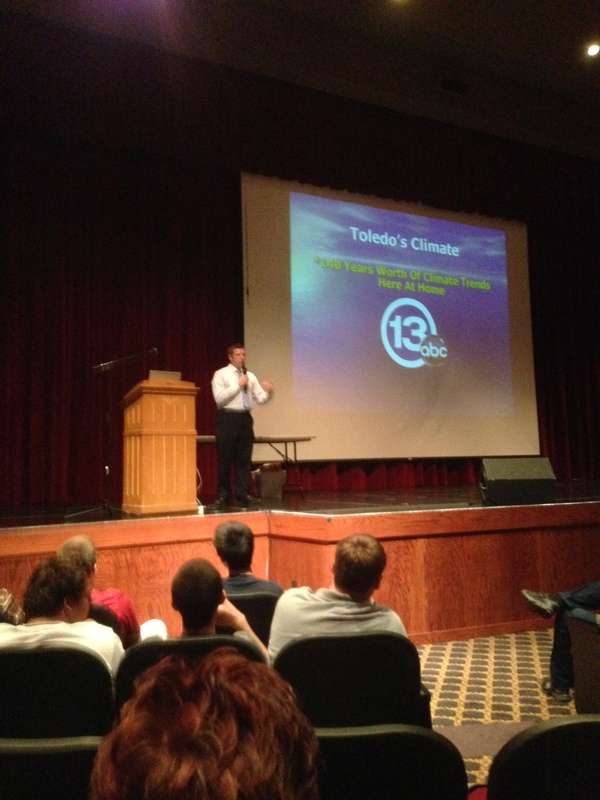 The first hour of the event included a presentation from local meteorologist Ross Ellet on Toledo’s weather history. 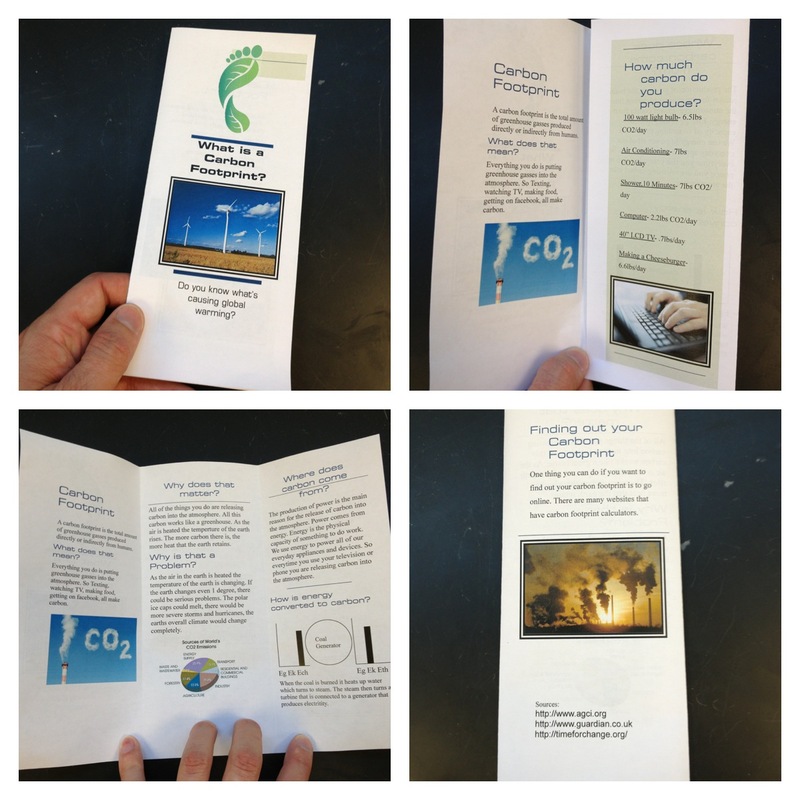 …I also gave a presentation on climate change and had students come up and help me with some demos. 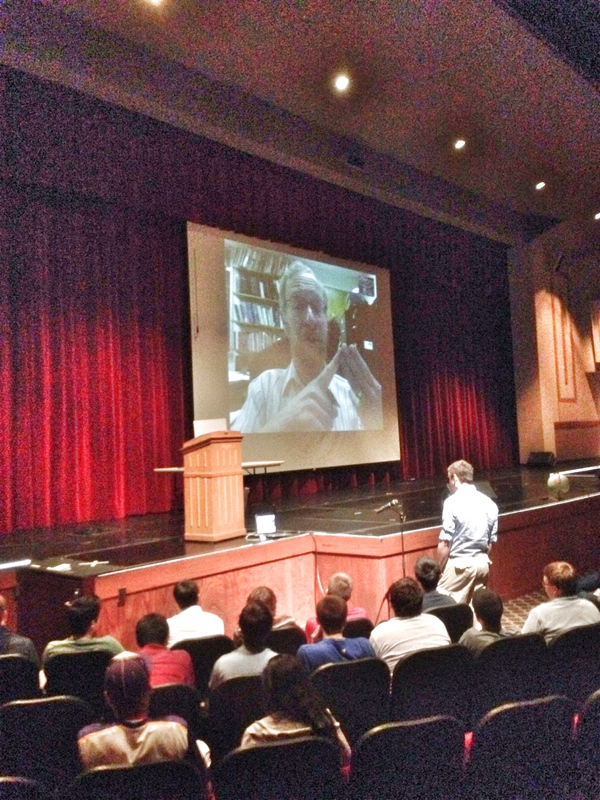 …and students had a live Skype conversation with climate scientist Richard Alley. We then invited everyone out to the lobby to join us for cookies and coffee while talking to students about their projects. Overall, it was a positive event that we hope to build on in the future. It gave our community a chance to learn science and our students a chance to share their knowledge outside of the classroom. Many departments like art, music, athletics, and theater all invite the community out to appreciate their crafts…why not science!? For the past 5 years, my students (mostly high school seniors) have spent the majority of the school year learning Newtonian Mechanics – a way of thinking about how things move and why they move that way. We’ve dabbled a little in other areas like light, sound, electricity, and magnetism…but most of the year has been devoted to mechanics. Lack of exposure to modern topics. Lack of student choice in the curriculum. Some students lose interest. Little on the history or nature of science (something most K-12 science courses are slim on). I would truly like to incorporate more modern topics. However, most modern topics make little sense without at least a semi-quantitative mathematical and graphical understanding of motion. At the very least, we should strive for this as part of the course. Also, motion must be related to the physical world. Some have tried calling motion a “math topic”. I suspect that this often neglects the development of these concepts in relation to reality and typically without careful operational definitions of concepts (position, velocity, time). As for forces, I could see them being treated more qualitatively, but again they must be developed, defined, related to real situations that we can observe with our senses, represented with multiple diagrams, and connected to students’ understanding of motion. Forces make little sense without understanding motion. I showed pictures of ancient fossils. I told them a story about large beasts that once roamed the land. We talked about the very bad day they had 65 million years ago. Could it happen again…? We watched video of the giant rock that exploded over Russia recently. We talked about the space rocks that hit the earth every day. How could we stop a big one? What tools would we need? What knowledge would be necessary? An asteroid was headed our way. We had to stop it. We prepared. We decided to knock it off course. We studied the motion of our ramming spacecraft and the asteroid. We built a model. We wondered whether our model would be good enough. We practiced. We planned. The day of the asteroid came. Would our knowledge be enough to stop it? Could we save the world? Weekly physics journal responses (only 1st trimester) – While we only used these during the 1st trimester, they were a great window into student thinking, gave students the opportunity to reflect, organize, and articulate their ideas. Perhaps they encouraged students to be more reflective from the start of the year. 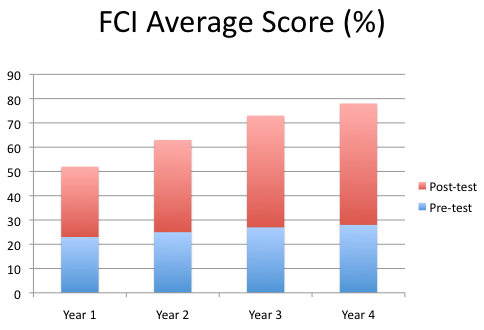 Better use of Standards Based Grading – This was my 2nd year using the assessment system and perhaps I explained it better and used it more effectively to promote 2nd, 3rd, & 4th attempts at mastery. Students also weren’t too resistant this year due to a heads-up from the students the previous year. Better discussion facilitation – I was perhaps more consistent in promoting scientific discourse this year. Students were encouraged to articulate their ideas to each other more frequently and I more consistently expected contributions from all members of the class during class discussions. I also was lucky to have some smaller class sizes this year, which I think contributed to more frequent and meaningful interaction with each student. Focus on the underlying model – I often would ask students to “zoom out” of the problems we just discussed and think about the main concepts behind them. I’d also ask them what was similar about all of the problems, focusing their attention on the underlying model being deployed. Maybe this is just a result of experience. I think I am doing a better job of emphasizing what’s ‘most important’ about each set of problems. This year I tried to incorporate meaningful, long-term, creative opportunities into the modeling cycle. Students had to make or do something that mattered with the science model they developed. I’m still trying to figure out how to best plan and carry out these projects, but I’m happy with what students did this past year. 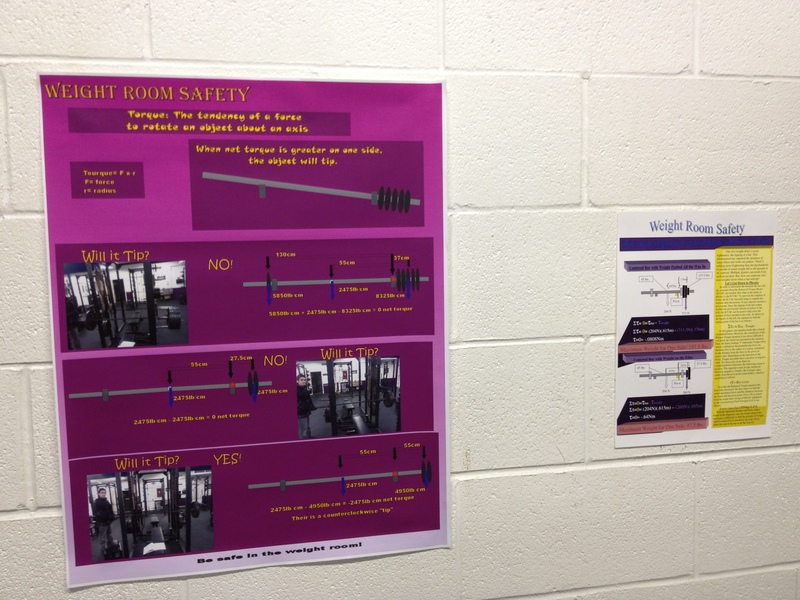 After initially developing a model for torque (see how here) we decided to apply this model to the school’s weight room and make safety posters for weightlifters. 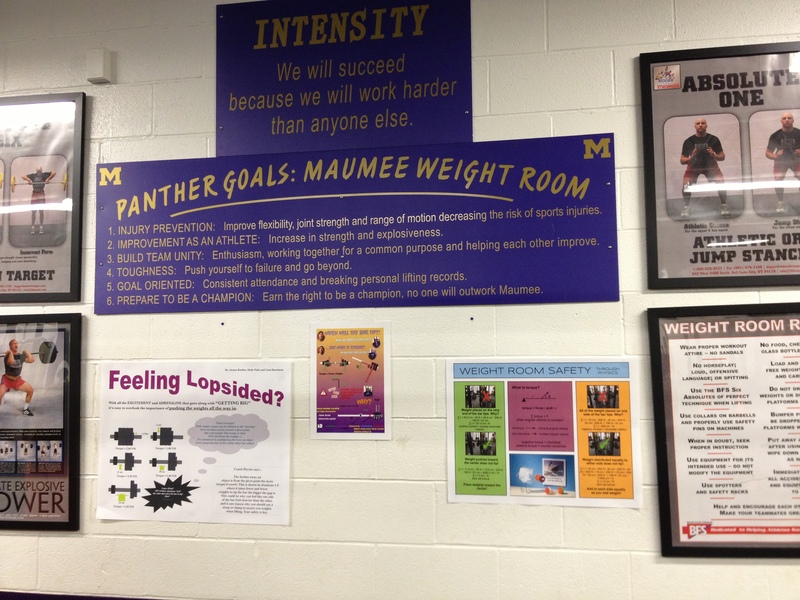 This included spending a couple of days in the weight room bulking up, taking measurements, doing calculations, and in other words “getting to know the balanced torque model” really well. From the video above, you can hear the rich conversations this context provided. So many questions came up that would never have come up if we were only using ‘book problems’. 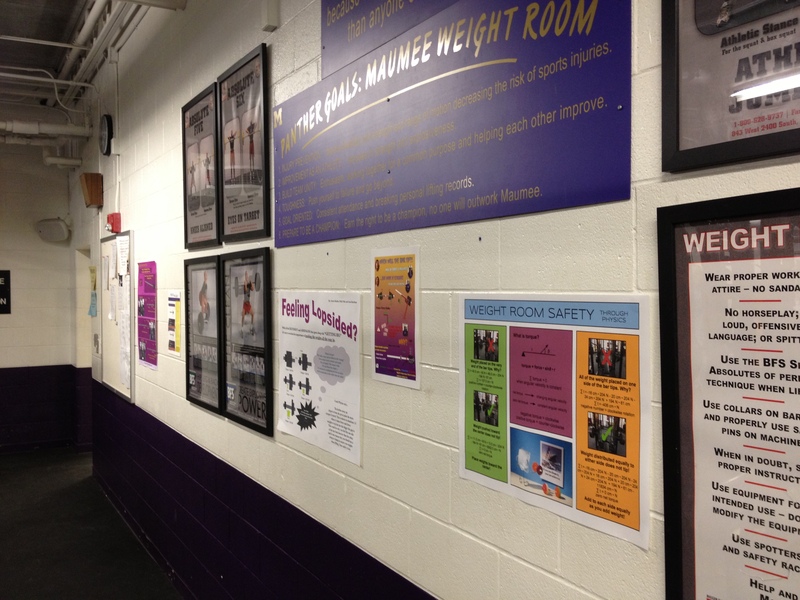 We also spent some time in the computer lab designing posters to keep those weight lifters safe! We started by watching some episodes of “Beyond the Light Switch” and the recently released “Do The Math” video about human energy use and climate change. The project (guidelines here, final self eval. rubric here) was then introduced as a motivator, then we developed and deployed the conservation of energy model using the modeling materials for about 1.5 weeks, then we used what we learned to apply it to making products and planning presentations to community members. I’m telling you, have your students present to groups outside of your class! The motivation was way higher and students didn’t see this as “just an assignment”. They knew that they were doing something that mattered by presenting to groups in the community. Most students wanted to present to younger kids at the other schools in our district. What leadership! Also, I was still able to watch the presentations via video. In their final papers, many students talked about how much they enjoyed this project and that I should continue to do this in my class. 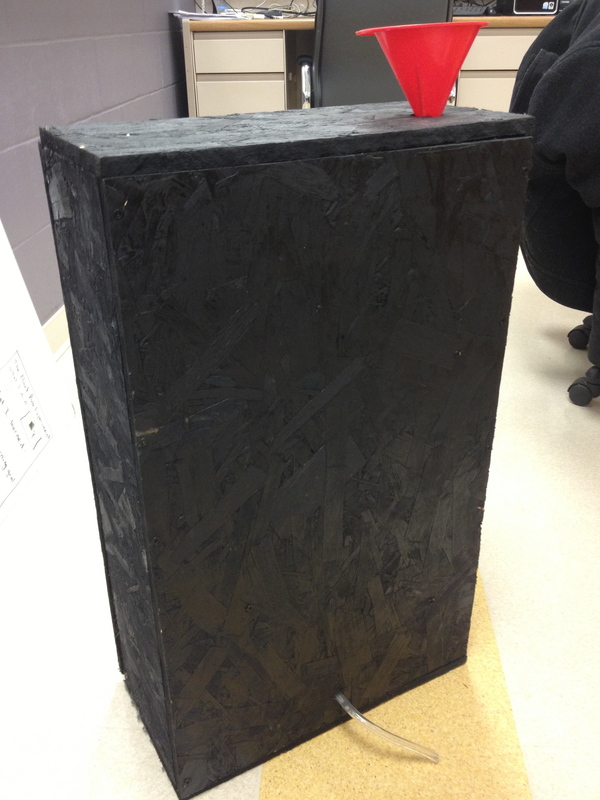 We spent some time working with a black box that would output different amounts of colored water when water was poured in. We collected data, designed models to explain the data, collected more data, refined our models, and then presented our models to each other to defend them. In the process, students acted like real scientists and learned about what it meant to ‘do science’. I also introduced many scientific terms and ideas to them during this investigation. We constantly referred back to this activity throughout the semester as we did other science investigations. It really seemed to stick with students. I’m really happy with how this portion of the class turned out. I’ve really come to appreciate the idea that students must understand how scientific ideas (models) are developed in order to appreciate the scientific discipline and what it’s all about. Here’s a packet we used to guide our discussions and data collection. Much of this unit was taken from or based off of work from MUSE. They’ve done some really excellent work in designing progressive science curricula. Model vs. Theory vs. Law, What’s the difference? I’ve been thinking about this for a while. I’ve read through Hestenes’ articles (see below) and ended up in the same place that I started. Sometimes he uses ‘model’ as a verb and sometimes as a noun. I’m confused. Can anyone help? The articles are below, with some parts quoted. (1) Constituents: Names for the thing of interest and the things in its environment. (2) Descriptors: Object variables, State variables, Interactions. (3) Laws: Laws of change, Interaction laws. (4) Interpretation: Relates descriptors of the model to properties of the object. “Theories inform the creation of models, and laws are part of models.” …? Scientific conceptual models are ideas or sets of ideas (encoded somehow in neurons in the brain that we can create, access, and use to interpret sensory information) that are used to represent or explain parts of physical reality. Physical representations (drawings, diagrams, symbols, physical objects) can be used to represent and communicate the conceptual model. To me, theories and laws also fit this definition of a conceptual model. The articles seem to imply that laws are somehow only part of a model and that a theory is somehow outside of a model. What do you think?